(Great Falls, Mont. )-Senator Jon Tester today brought Federal Communications Commission Chairman Tom Wheeler to the Treasure State and launched his #ConnectMT initiative to address the connectivity challenges facing Montana's businesses, schools and families. Tester's #ConnectMT initiative will expand high-speed internet access, guarantee rural call completion, and strengthen local broadcasting in Montana. Tester brought Wheeler to Montana to see firsthand the challenges of connecting businesses, schools and families in a rural state. "In the 21st Century, reliable Internet access is essential for families to stay connected and for businesses to thrive," Tester said. "My Connect Montana initiative will address the rural connectivity challenges that folks are facing across our state. By expanding high-speed Internet, strengthening rural call service, and protecting local broadcasters we can keep Montana connected around the globe." 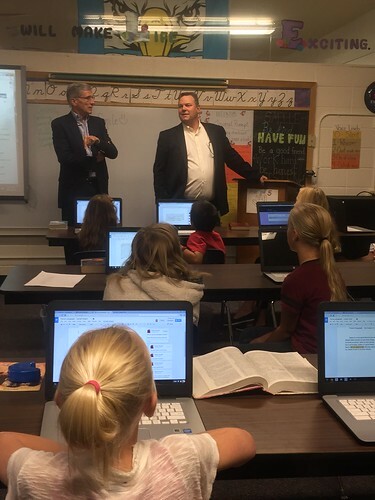 Tester and Wheeler visited Fairfield Elementary School where they are using FCC funding to expand broadband access and invest in new digital technology. They then traveled to Great Falls where they met with local business leaders, broadcasters, and toured the Great Falls Cascade County 911 Emergency Center. •	Tester is pushing the FCC to enhance the Universal Service Fund by making it more predictable and making it available for standalone broadband service. The Universal Service Fund provides critical resources to rural broadband carriers to expand Internet access in rural areas. •	Realizing that many calls in and out of rural Montana aren't being connected, Tester is sponsoring the Rural Call Quality and Reliability Act that establishes basic standards for intermediate call providers who transmit phone calls to all areas of the U.S.
•	Tester is sponsoring the Local Radio Freedom Act to affirm that Congress should not impose any new fees or royalties on local radio stations for broadcasting songs or other over the air content. •	As the FCC facilitates spectrum reallocation, Tester is working to minimize the impact on rural broadcasters that rely on spectrum to deliver over the air television.